It was a typical long and frustrating stop-start drive back from Leeds last night along an M1 motorway littered with a seemingly interminable and neverending series of frustrating and unnecessary fifty mile per hour speed restrictions and the longeur gave me time aplenty to contemplate the afternoon’s entertainment at Elland Road. To be honest I had had a lot of misgivings about our prospects given our shaky start to the season, the catalogue of players out with injury and the need to integrate so many new players into the team. Elland Road is also far from being the most welcoming of venues or the easiest introduction to the realities of Championship football with Leeds’ one-eyed supporters spitting bile and hatred and harking back to past glories as well as subjecting the referee to a nonstop barrage of verbal abuse and demands for nonexistent decisions. Leeds are by no means one of the best teams in the league but they are certainly strong, determined, tough and rugged and that, combined with the immutable law of the ex with the Uwe Rosler, Stuart Dallas and Tom Adeyemi factors also to take into account made me fear for our prospects. I was really disappointed and frustrated on the way home but not for the reasons that I had anticipated. Instead, I could not understand quite how a Brentford team that had risen to the challenge and a tough test of their poise and resolve had come away with only one point instead of the three that they so clearly deserved after a skilful and resilient display that should have been rewarded with a victory instead of the one – one draw that resulted. There was much to be pleased about and the positives far outweighed the negatives. Marinus employed a 4-3-3 formation which worked well and we looked compact and well organised. For the first time this season rather than having a bunch of strangers who looked as if they had been introduced to each other in the changing room before the match, we finally looked like a team in which everyone knew their job and what they were supposed to do and for the most part they completed their tasks to a very high standard. David Button hardly had a save to make such was the quality of the defending in front of him which restricted the home team to very few chances. Harlee Dean easily won his battle against the giant, lumbering Chris Wood who took the expression a minimum of effort to new heights – or should that be depths? Harlee has been a new man this season. He looks fitter, sleeker and far more composed and is finally content to let his football do the talking do him. In other words, he has grown up and matured and has developed into an excellent Championship calibre central defender who totally merits his place in the team, leads by example and is a captain in everything but name. James Tarkowski had also had a difficult and inconsistent start to the season but yesterday saw him at his brilliant and composed best where he combined anticipation and perceptive use of the ball with some excellent defensive work. Of course we miss the presence of the long term injured Andreas Bjelland but the Dean/Tarkowski partnership is flourishing and they totally dominated their opponents. Max Colin too settled down after a difficult start which saw him booked for a late challenge before he was substituted late on after a dogged performance against the tricky and direct Stuart Dallas. Jake Bidwell was calm and competent and came the closest yet to his elusive first goal when he just failed to angle his header into an empty net after Judge’s cross went over the goalkeeper as he went walkabout. If I have spent a lot of time discussing the Brentford defence then I make no apologies, as for the first time this season they looked calm, confident and competent and really deserved the reward of a still awaited first clean sheet. Diagouraga and McCormack dovetailed well and protected their back four with a combination of tenacity and bite. Toumani looked back to near his best, which is welcome news to all Brentford fans and McCormack was tough and combative. He tested the patience of the excellent referee, Nigel Miller, but knew exactly just how far he could go and managed to avoid a booking. It is worth noting that we finally conceded a goal just after he had been moved to right back to replace Colin and we missed his influence in the middle of the field. Konstantin Kerschbaumer is finding it hard to settle down and nothing much that he is attempting so far is coming off. Yesterday was no exception as he underhit his shot from right in front of goal in the first minute and all too often he was knocked off the ball or failed to find a man with his passes, unerringly choosing the wrong option. And yet…and yet, there is definitely something about him and I just feel that he is still coming to terms with the physicality and pace of the Championship. Alan Judge was the source of pretty much everything good that we did. He buzzed around on the left wing and led the Leeds defence a merry dance, twisting and weaving his way through them and Sol Bamba will be having nightmares about the ease with which Judge beat him on several occasions. It was good to see him attempting so many shots even if his radar was off and it was his dribble and perfectly timed pass that gave Marco Djuricin the chance to take his time, turn inside Cooper and demonstrate his clinical finishing ability by unerringly finding the bottom corner. This was the first time that Brentford have scored first all season and it certainly felt good and you could see the confidence course back into the veins of players and fans alike. Marco impressed on his debut, showing skill on the ball and good vision. He is not going to work tirelessly and run the channels and harass defenders, but he is undoubtedly a goal scorer, playing on the shoulder of the last defender and he will score regularly if he is given the service that he needs. He should have been celebrating a second time on his debut but after Silvestri’s slack kick out he was set up perfectly by Vibe but his first time effort pinged back off the post and bounced away. On such small margins are games settled as Leeds would surely never have recovered from a two goal deficit. Lasse Vibe is also finding his feet. He is quick and sharp but his control and first touch let him down when Tarkowski slid him in on goal. He is at his most dangerous who played more centrally and I do not think he is best suited to his current role wide on the right. Ryan Woods unfortunately had a debut to forget as it was his slip in midfield which led to the equaliser. He was introduced as a late substitute but had not yet accustomed himself to the pace of the game when he was put under pressure when Button cleared the ball to him, dispossessed, and Leeds took full advantage when Dallas and Wood worked the ball to Antenucci who bent the ball past Button for an undeserved, if clinically taken, equaliser. The pass was on from Button and we generally retain possession so well in our half of the field that it is harsh to carp when occasionally things go wrong, as they did here. Woods recovered from his error and looked confident on the ball and showed enough to demonstrate that he will prove to be a massive asset for us. Philipp Hofmann came on for the tiring Djuricin soon after the hour but he had to be replaced himself near the end by Canos, our third newcomer, after incurring an injury. The kindest thing to say about Hofmann is that he is still finding his feet in his new environment. 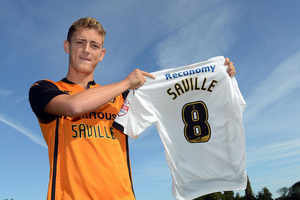 He is massive but as of yet shows no inclination to use his bulk and strength and has been easily bustled off the ball. It must be a massive learning curve for him but he needs to impose himself rather than stand on the periphery of the action and contribute very little. He combines physical presence with massive ability on the ball, and once the penny finally drops he could take this division by storm – it is up to him to learn and adapt. Canos too looked good on the ball and showed he had a trick or two in him. He will certainly contribute throughout his stay, take the Championship in his stride, and will not be overwhelmed by the challenge he faces. So one point only when we should have taken all three was a tough return given everything that we put into the game, however I am sure that spirits within the camp will have been raised by the performance and there were more than a few encouraging signs that the time on the training ground over the international break had been well spent. There is still much that needs thinking about and possibly tinkering with, particularly up front. Vibe has already demonstrated that he is a high quality player but we are not using him to his best advantage marooned out on the right wing where he also finds it hard to put in a defensive shift. We lack the pace and incision that Andre Gray brought us and we could certainly do with his selfless channel running and chasing of lost causes. Neither Hofmann nor Djuricin are that type of player and we will have to adapt our play accordingly. Djuricin though, brings us something that we have lacked for a long time – a clinical and calm finisher who will probably convert so many of those close range opportunities that always seem to be ignored or go begging for us. The team has remained up north to prepare for the Middlesbrough match on Tuesday night. Nobody needs reminding that it was Groundhog Day when they beat us four times running last season and given the positives that we saw yesterday we will travel there filled with hope that we will put on a performance and take something from the game. Any impartial and objective observer would have agreed that Brentford fully deserved to win at Elland Road on Saturday. Their margin of victory was narrow and Brentford squeaked home with a single goal from Alex Pritchard. The statistics, though, tell a totally different tale. Brentford dominated possession, attempted and completed far more passes then the opposition, committed less fouls and had more shots on target. David Button walked off the pitch at the end of the game with his kit unblemished, so little had he had to do. 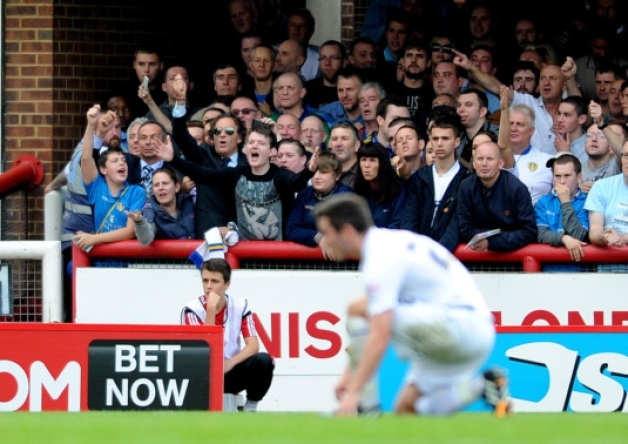 Leeds had appealed in desperation for three penalty kicks, one of which appearing to be a close call but had otherwise only threatened in the last few minutes when they made a desperate late surge towards the Brentford goal and forced a few scrambles which might have gone their way had it not been for some resolute defending. The referee was strong and did not allow himself to be swayed by the baying hordes of home supporters screaming for free kicks and penalties. Brentford held out for a comfortable win and their only complaint would have been that they had missed a number of gilt-edged chances to make their victory far more conclusive and less stressful right at the end. I don’t think Leeds were unlucky to lose to Brentford on Saturday. I thought we should have had a penalty kick in the first half and I thought the referee was very average. But most of the major decisions he got right. Neil Redfearn also thought we should have had a penalty in the second half but I didn’t think that was a penalty kick and that’s just opinions. But I thought we were second best in the game and Brentford deserved to win. Brentford are one of the better teams in the league and we’re not at that level yet I don’t think. I hate reading that Brentford are better than us and we are still a long way behind them. Having supported Leeds United during the Bremner, Giles, Gray era its very hard to accept that Brentford can be better than us. I know its true but it just fills me with sadness. Lets hope we don’t have to wait too long before Super Leeds are back where they belong. I totally agree with you Eddie, Brentford, were the best side to visit Elland Road this season, they did their home work on Leeds and we did not force a single save from their keeper, but we were worth a point because of our gutsy performance. There was a sense of disbelief that not only was it ludicrous that a team like Leeds, steeped in history and past glories, should be forced to sully their hands and demean themselves by actually having to play the likes of Brentford but that we should have then fallen down at their feet, paid homage to them and then allowed them to walk all over us. But it’s an indication of where we are at the moment as a club that we can’t beat Brentford. That referee wants kicking out of football – Leeds players were kicked off their feet time and time again – he gave Brentford ALL the free kicks, Austin was thrown to the ground in the penalty area – and he gives Brentford a free kick. I lost count of how many blatant corners we SHOULD have had – the Football League is corrupt. However, with the assistance of Mr Salisbury and his officiating team, Brentford couldn’t really lose the game. It wasn’t just the clear penalty that Leeds were denied in the first half that made it an inept performance, but the referee’s clear insistence in giving Leeds absolutely nothing, whilst gifting Brentford a free-kick almost every time a tackle was made. Although they had possession United rarely troubled Brentford’s keeper but we still didn’t deserve to lose. Is there any way that the performance of the officials can be examined and questioned by the Football League? If Leeds were not allowed to play football and were constantly pulled back, then the Football League needs to look at the wider implications of that. I have never read so much myopic and delusional drivel in my life. Their argument can best be summed up as: we are Leeds, we have a divine right to win and when we don’t then it can only be someone else’s fault, and by the way there is a conspiracy against us too. Everything about Elland Road was living in the past: The aggressive and one-eyed home fans who bayed at the referee and the away fans throughout the game, the way we were packed away in a distant, dank and dark corner of the ground and ripped off for the privilege, the constant tape loop before the game of, admittedly, great goals from their far and distant past and the distinctly old fashioned and faintly martial club song that resonated around the ground. Leeds remain in a time warp and are firmly stuck in the early and mid 70’s, a period when they deservedly dominated the English game. It is easier and more comfortable for them to remain there, in their bunker, than take the tougher approach of self-examination and understanding why the world has passed them by. Their fans cannot and will not accept that they have fallen upon hard times through “living the dream” and abject mismanagement as well as the normal cyclical nature of good fortune and success. They have a well developed sense of entitlement and arrogance which was truly bemusing to witness in the flesh and then read about. And yet, in truth, loyal Leeds supporters deserve far more than they have received over the past decade and more, and their reaction to Saturday’s defeat was simply their coping mechanism as they are totally unable to comprehend that the football world has moved on and their prehistoric tactics and approach have been superseded by a new breed with clubs such as Bournemouth and Brentford at the forefront. The fact that Brentford took six points from Leeds this season without conceding a goal or barely a shot on target speaks volumes and should be lesson enough for the Leeds fans, but there’s none so blind as those who will not see. Sometimes your day is touched with gold dust and you sit back the following morning and just bask in the happiness that is coursing through your entire being. This is how I am feeling today. My son, Nick, is twenty-three now, nearly three years out from graduating with a Politics degree from Leeds University and making his way in the world. He is doing just fine, he has an admirable work ethic, is never one to give up, or complain too much, he is kind and thoughtful, his current success is well deserved and his future is bright. He is establishing himself in his career, has moved into a lovely new flat and has some decent and caring friends. He also manages to find some time in his frenetic schedule for his loving and proud parents, and yesterday was one of those days. Replete from a wonderful Friday night chicken dinner lovingly prepared by his incredible Mother, we waddled to the car and set off bright and early together for Leeds. 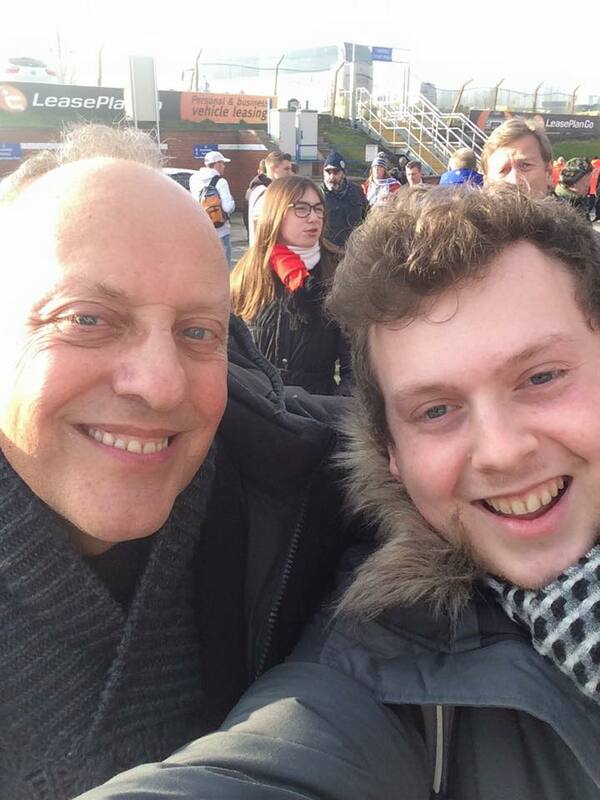 Don’t think for one moment that Nick is a football fan, at best he tolerates it for my sake, but he wanted a lift to Leeds so that he could spend some time with his old University friends and the cost of the ride was to pass the day with me and watch Brentford play at Elland Road. Nick used to come with me occasionally to Highbury where, as a teenager, he was tempted more by the plush leather seats and the wonderful sweets kioks outside the stadium: Two for a Pound was the cry, and I can hear it still resonating across the room as I write. He had done his homework and the journey up passed in a torrent of conversation about his life and aspirations, “New Brentford” and the likely date for the move to Lionel Road. Nick is well clued up on transport and planning issues and was keen to pass on his thoughts and advice. The hours seemed like minutes as we flew up the M1 and the only mystery was why I never seemed to get a red winegum whenever Nick passed me the packet as I drove – a real conundrum that will remain forever unsolved. We parked beside the stadium at midday and decided to forgo the pleasure of a walk around the town centre but instead spent a lovely lazy hour or so in McDonald’s, reading the papers, totally comfortable in each other’s company with no need for constant conversation. A perfect morning! Frankly I would have been more than happy if the day had ended then after quality time spent with my son and a feeling of warmth, love and contentment, but there was to be no end to the delights of the day. Little Old Brentford simply took over Elland Road, a dilapidated mess of a stadium, that, like its team and rabid fans has seen far better days and Jethro Tull’s “Living In The Past” should replace the tired and creaking and faintly martial “Marching On Together” as the club’s anthem. Their supporters, incandescent with rage, and fuelled with frustration and thwarted aggression, spent the entire match harking back to their past glories, and a time when they really were good, and despite their enhanced sense of entitlement, condescension and disbelief at the indignity of having to play the likes of Brentford, it was hard not to feel a little bit sorry for them given how they have been sold down the river by a seemingly neverending series of unsympathetic owners. Brentford just played their football as only they can do. It took time for them to gel and they were slightly off the pace in a goalless first half that saw Leeds, inspired by the skilful Cook and Murphy, two players in the Brentford mould, huff and puff and press us high up the pitch, but seldom threaten. We simply sat back, held the ball and probed for openings when we were finally able to beat the press. Pritchard’s gorgeous flick sent Gray hurtling through the Leeds defence with a clear run in on goal. Bamba chased after him, his hot breath on his collar, and for an unworthy millisecond I hoped that the straining defender would catch Andre and bring him down for a certain red card and penalty but Gray held him off before only finding the keeper with his shot when he had to score. His overall hold up play and movement was as excellent as ever yesterday but he has lost his touch in front of goal and Mark Warburton could be seen on the touchline visibly encouraging his faltering striker and we can only hope that his fallow spell ends shortly before his profligacy costs us dear. I watched Callum Wilson score comfortably for Bournemouth at Wigan from two similar opportunities last night and that is the difference between a striker at the top of his game and a player still accustoming himself to the rigours of league football. It will come for him – it has to, if we are to maintain our exalted place in the Championship table. Jota too missed horribly when he was left clean through and dillied and dallied on another occasion without getting his shot off and Pritchard was taken out by Cooper when running through and the defender saw yellow when red might well have been the verdict. We defended well when necessary and were troubled only when Morrison forced a comfortable save from an otherwise untroubled Button, Dean committed his one weekly error and sliced horribly past his own post and Moses tussled with Austin who was too keen to go to ground and we escaped without punishment. We upped the tempo in the second half and Leeds could not live with us. Douglas and Diagouraga were an impassable barrier and Prichard’s feet twinkled to good effect. We dominated without looking dangerous until Toral replaced the ineffective Jota and his physicality and tenacity gave us the impetus to break the deadlock. He charged down a clearance, ran menacingly into the area and slid Diagouraga through, and his perfectly weighted low centre was thankfully missed by the straining Douglas before Pritchard scored easily. We erupted with joy, the Leeds supporters reacted with fury – how could they be possibly be losing to the likes of us? It had to be someone elses’ fault, so they picked on the referee, Graham Salisbury, not one of my favourites from our previous encounters with him, including the JPT Final against Carlisle and the recent penalty incident at Watford, but he stood firm, protected our players from the brunt of the physical onslaught of a frustrated home team and denied them two penalty kicks after blatant dives from the overly aggressive Austin. As always after we have scored, we looked for another, and Toral smashed a beautifully controlled volley against the post before Long, who put in an excellent shift, twice came close to breaking his duck, under hitting a clear chance from in front of goal and then failing to beat Silvestri from a tight angle. As always there was a sting in the tail and Sharp shot wastefully wide from an excellent opportunity before an almighty scramble in front of the Brentford goal saw last minute disaster averted through Bidwell’s brave and brilliant defending. So we won, and in all honesty our victory was far more comfortable than the score suggests. We were tight and organised at the back and stood up to considerable intimidation from a committed home team. We concentrate on playing the beautiful game but we are also not a soft touch any more and Dean, Tarkowski, Bidwell, Odebajo, Douglas, Dallas and Diagouraga all put their body on the line and were resilient and committed. We are coming of age and wins like this show just how far we have travelled and the development potential that still remains within the entire squad. Like the Bees, my son Nick is still a work in progress but he has already become a young man of substance, stature, charm and ability. He too is on a long journey and one which will, I am sure, end in happiness, fulfilment and success. I am delighted and proud to accompany both of them on their voyage of discovery. I was watching the Rotherham versus Leeds match last night on Sky Sports and had a tough time deciding who I wanted to win. A win for Leeds would keep Rotherham well below us, victory for the home team would ensure that Leeds remained in limbo. Maybe a draw then would be the best result for Brentford? Even taking into account the fact that it was a local derby and that there were Yorkshire bragging rights at stake I was staggered at just how little incisive football was played on the night. Leeds were neat and and, just as they had done at Griffin Park recently, they played the ball around carefully and accurately but rarely in areas where they could threaten or hurt the opposition. It was all very safe and unadventurous. They had sixty-two per cent possession but I suspect that most of it was in their own half where they persisted in passing the ball backwards and sideways without attempting the killer pass. Warnock in particular, for all his ability, seemed to be allergic to passing the ball forward. Of their fifteen shots at goal very few were from within the penalty area and they totally flattered to deceive. Leeds defended deep and were overly reliant on their excellent goalkeeper Silvestri to keep them out of trouble given how weak their central defenders were in dealing with Rotherham’s customary aerial bombardment. The goal that they scored was truly excellent and out of keeping with their approach. The two strikers finally combined and a subtly and perfectly timed through ball caught the home defence sleeping and totally square, and Mirco Antenucci judged his run perfectly to stay onside and slip the ball home. Proof that there is ability and cutting edge there when they wish to show ambition. Leeds seemed to think that one goal was enough, sat back and allowed the home team, who had started nervously and cautiously, to claw their way back into the game and begin to ask questions of the visitors. Much more on Rotherham later, but Leeds look like a team that is sleepwalking gently through the season. They possess lots of skilful players who are comfortable on the ball but they lack a leader or someone who is prepared to take the game by the scruff of the neck and attempt to seize the initiative. They just appear to be waiting for something to happen, or for somebody else to take responsibility. They are also naive and vulnerable in defence and do not react well to teams that press them. The spirit too seems to be lacking and I detected little evidence of players who were prepared to put their body on the line or support and cover for their team mates. I realise that they have an almost totally new group of players who are unaware of the demands of Championship football, and their manager has barely got his feet under the table, but the Elland Road supporters are an unforgiving bunch and I very much doubt if they enjoyed or are prepared to accept for very long what they saw last night. They are a club in turmoil with no real plan or approach and do not appear to be a happy or united bunch. Leeds are totally under-performing and I see very few signs of that situation changing in the immediate future. I do feel sorry for their supporters as they surely deserve far better. As for Rotherham, it is so easy and totally wrong to underestimate them or damn them with faint praise. Yes, we all have a view about Steve Evans and Paul Raynor and I would like neither of them anywhere near our club, but the truth cannot be denied or minimised – they get results and their team play for them and are well drilled. The Millers are relentless, they challenge you, put you under pressure and never give you a moment’s peace. They keep their foot on your throat and will steam roller you if you allow them to do so and do not stand up to them. They are also very good at what they do. Frecklington is a terrier in midfield, snapping away at your ankles and never allowing the opposition to settle on the ball. Alex Revell is immense in the air, wins everything, possesses a more subtle touch than you would expect, and also does so much unseen work chasing and tackling back. It was he who was in the right place to capitalise upon a half-save from the keeper to equalise. It was also Revell who slid in to win the ball back in midfield and allow Clarke-Harris to stride on and score the winner with a shot of awesome power and accuracy. The back four are well drilled and tenacious even if they lack pace, and Collin is an excellent shot stopper in goal. The jewels in their crown are Paul Green who has vision and accuracy in his passing and the star man, Ben Pringle, who has a wand of a left foot. He keeps the opposition under pressure by crossing the ball in from the left flank as quickly and as often as possible knowing that Revell will come flying in to challenge for the ball and unsettle the defence. The only way to beat Rotherham is to stand up to their physical approach and defend in a brave and organised manner. Leeds wilted last night, thankfully Brentford did not last month when Tarkowski and Dean maintained their concentration and won their individual battles. If you can firstly keep them at bay and push Rotherham back, then ideally teams can put them under pressure, as they are susceptible to both pace and guile. 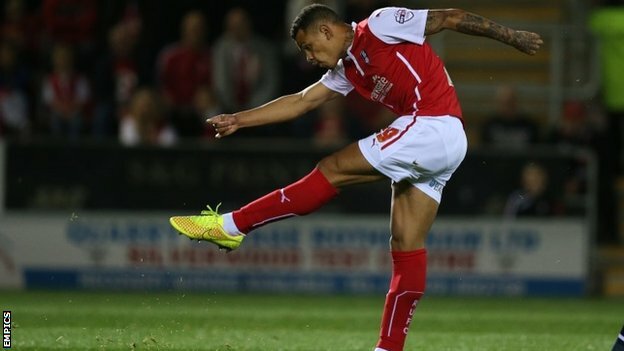 Rotherham have struggled to find an adequate partner for Revell, until perhaps last night provided them with the solution. Matt Derbyshire runs the channels well but is lightweight and appears to have lost his knack of scoring unlikely goals and Becchio is injured. I first noticed Jonson Clarke-Harris last season when he played against us for Oldham. He has pace and power in abundance as well as a powerful and accurate shot. He looks raw in the extreme but is also a real talent and I suspect that he was a prospect that came under careful review by Brentford. He apparently did not fit our requirements but Rotherham invested a club record fee in him last month and I believe that it will be money very well spent. Clarke-Harris will probably infuriate as much as he thrills and delivers this season , but that is quite normal for a young player lacking in experience and playing at a new and higher level. I look at the other teams in the Championship in terms of assessing the level of threat that they present to the Bees. Brentford have already defeated both Rotherham and Leeds and I see no reason why we will finish below either of them at the end of the season. Leeds are a team in crisis with no real pattern of play, Rotherham, on the other hand, are one dimensional but know exactly what they are doing and execute their game plan exceptionally well and effectively. Brentford also have an established style and approach which to date is both easy on the eye and successful. I don’t normally write two blogs in a day. It really is quite hard enough to write one! Given how they read I suspect you all think I knock them off in about ten minutes or so. Unfortunately the truth is somewhat different. These articles don’t write themselves and generally it takes quite a while to compose my thoughts and set them down on paper. Very often I sit there looking at that empty computer screen winking back malevolently at me and have absolutely no idea what on earth I am going to write about, but somehow it all seems to come right in the end, the words begin to flow, and, given that quite a lot of you make positive and helpful comments too, and seem to come back for more, I must be doing something right. I watched the Reading versus Wolves match at lunchtime with great interest and was impressed with our former loanee George Saville who used the ball excellently, but ran out of steam soon after halftime. He missed a wonderful chance when set free on goal and also still seemed to be playing on the edge, all too ready to flare up and react to any provocation and it was evident that Reading set out to wind him up and clearly succeeded in their aim. Given that we play them next weekend I watched Reading carefully. They were as neat and tidy on the ball as you would expect from a Nigel Adkins team but were porous and vulnerable at the back and left gaps that we could surely exploit. For a home team they seemed to create remarkably few chances, but still scored three times, yet more evidence that the finishing at Championship level is far more clinical. I then tried watching a terribly one-sided Premier League clash between West Bromwich Albion and a horribly limited Burnley team who I fully expect us to be playing against next season. Albion were no great shakes themselves, but were far better than their opponents, and won in a canter by four clear goals, with Saido Berahino scoring twice and looking a real handful. Hopefully his short loan spell spent slumming it at Griffin Park was a bit of an eye opener for him and helped him grow up a bit. It would certainly appear that he was taught some manners by Uwe Rosler and Gary Alexander and he does seem a more mature young man now. I have also spent some time browsing the Sunday newspapers looking, as I always do, for former Bees plying their trade elsewhere up and down the food chain, and what really interested me today was not so much who played yesterday but more importantly, who didn’t. Missing from action for whatever reasons were regular stalwarts such as Marcus Bean at Colchester, Ryan Dickson and Gavin Tomlin at Crawley, and Leon Legge at Gillingham. Most remarkably, Craig Woodman, a permanent fixture in the Exeter City team, was also absent yesterday through injury. More concerning for me was the continuing absence of stalwart David Hunt from the Oxford United squad. He is one of my favourite former Brentford players, as, just like Marcus Bean, he was always totally committed to the cause, as well as having the time to engage with supporters. I hope that he is simply injured and not slowly slipping away from us next to be seen playing outside the Football League. Of course that happens to every player eventually but he surely still has so much to offer. 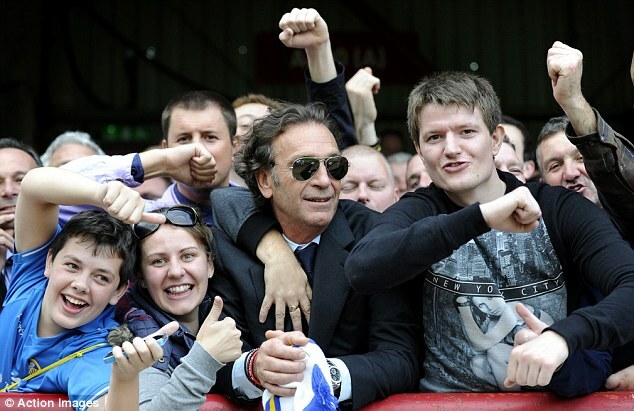 What caught my eye though more than anything else, were the remarkable photographs of the eccentric Leeds United owner, Massimo Cellino standing behind the goal alongside the (currently) adoring away supporters. Apparently he arrived at the ground accompanied by his minders and did not stay in the Directors’ Box but first sat amongst the Brentford fans in the Braemar Road Paddock before being removed from the home area to stand with his fellow Leeds fans in the Brook Road end. Was he so filled with passion for his team that he could only express his support sufficiently by standing behind the goal with his fellow supporters, or was it just more evidence of his need to be the absolute centre of attention, and milk the love, support and homage of the Leeds faithful, especially on a day when his new manager was taking charge of the team for the first time? Perhaps he was reinforcing his diktat that “I, Massimo am still Number One at the club” and making sure that everybody else was aware of the fact and duly recognised it. Given the problems that Leeds United have faced in recent years, maybe their supporters are glad to have him and are prepared to accept his idiosyncrasies. Perhaps they are just grateful for his attention and support and feel that he will restore them to their past glories. Maybe they are correct and he will in fact be successful. His early decisions and ability to change direction without apparent rhyme and reason do not fill me with any great confidence and I suspect it will be a turbulent ride for everybody connected with the club. To be honest I keep thinking about John Hurt, who gave such an unforgettable performance as the megalomaniac Caligula in “I Claudius”. Personally when I read about his antics, which have, of course attracted massive tabloid newspaper headlines, I just sat there and gave thanks for the people who are currently running our club so quietly, unobtrusively and effectively. We have a strategy and a plan both on and off the field, from top to bottom, and we seem to be keeping to it, and you know what, it is working because it has been well thought through and is eminently sensible and pragmatic. We have previously been subject to the whims of dictatorships and seat of the pants leadership, and personally I find that approach annoying, upsetting and totally exhausting. No football club should be subject to the whims of one person acting alone without any checks or balances. And it never works for long either. I have no problem with Leeds United and I wish them every success apart from when we next play them later on in the season at Elland Road, but I know which team I would rather be following, and I well suspect which club is better run. The Leeds United fans were good natured in defeat yesterday and recognised and accepted that they had been second best on the day, but they were, perhaps understandably enough, pretty patronising about “little Brentford” and they described us on their message boards as a small club with a terribly old fashioned stadium that in previous years they would not even have deigned to play in a preseason friendly. Well, times have changed and I far prefer our immediate future to theirs. Oh and I believe that Matthew Benham has also been known to stand on the terraces with his fellow Bees fans, but given his lack of public profile and desire to remain incognito and firmly behind the scenes, I suspect that hardly any of them even recognised him!